Kylie came from Texas and was being sent to the EU list due to fearful. 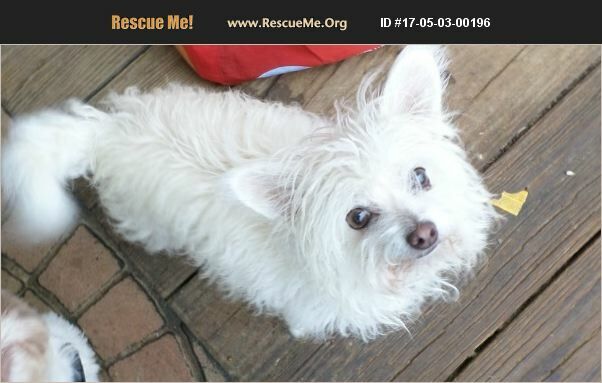 Kylie is about 6 pounds, they said Chi mix which thinking mixed with Maltese as she is pure white with mid length hair. Kylie likes calm dogs and best with someone with only 1 other dog. She is about 4 years or so, does well with potty outside, Kylie has been fixed has all shots and micro chipped, Thinking her best suited home would be with adults and calmer pets not use to cats she barks at my cats. So best with no cats in a home. Took her to my vets as she has had a couple seizure's, thought it was low blood sugar as when it happened I gave her sugar water and she came out of it. He did test her glucose level after I had given her sugar water and it was fine, he is thinking more like seizure's, he gave me a script for this Phenobarbital, 1/2 tab a day, gave my enough for 2 months. My little 4.5lb Yorkie also has seizures low blood sugar attacks I call it, he is now 11 years old, so don't let this stop you from giving her a new home. She does best with Females. Loves to be a lap dog. Kylie is now looking for her forever home, she is a good girl. :)Took her OFF the Phenobarbital as there is no difference in giving her this, she remains the same, so dont think wise to keep her on this. She had one the other day and I gave her sugar water and she came right out of it, so really thinking its just like by Buddy Yorkie low blood sugar attacks which is no big deal just give them sugar water and there fine. She did have an injury to her right eye due to a dog bite she lost her site in that eye. Please help her find that special home. She really needs a home. Would have to come to your home for the meet and greet, she is just that way, and have done this before with some of the dogs that I rehomed, she would be more comfortable doing it this way.